Been thinking of posting a picture of my study space for ages. Unfortunately, I don't have enough time to spare to study intensively. Online playing schedule: KGS most nights after 8pm CST. Sundays available anytime but on in the morning and evening. That is a beautiful setup. Sadly, since I share an apartment with three cats such things are not possible for me haha. I came to go through Kawabata and was introduced to a whole new world. 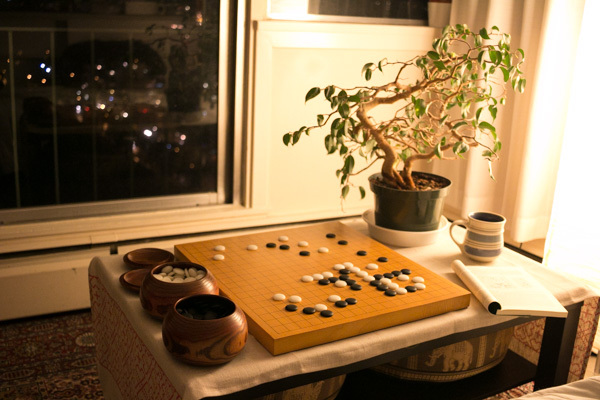 We need more pictures of Go boards and cats! They always make my day. I'd get an updated picture of my Go "study" space, but all it would be currently is a giant stack of boxes, with my Go board in a box somewhere at the bottom of the pile. The filename reminded me of this cartoon also named catgo. Sorry, I don't know the source or maker. I do not know who 'tango' is. Someone from here? My very humble space for study. Been waiting the time when I could show off a Go Study Space that I could proudly call my own. Hope you guys like it! The board is an agathis 2.4" table board. The stones are size 32 double convex yunzi. The clock is an awesome Chronos touch clock which my best friends dad let me use. 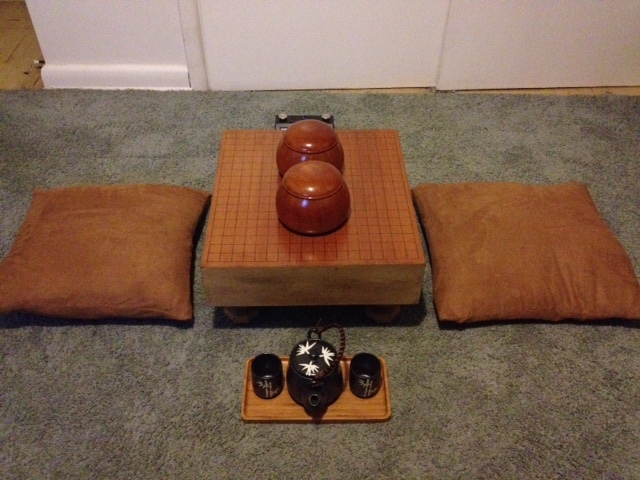 The tea set I got for a steal from Ross. And the table is one that I built myself. It has a hole in the center where the table board fits in perfectly. Just a reminder that this topic exists. No one has posted in it for over a year now! The view of my home office is a bit distorted, but that's basically my room to always return to for my own interestes. There's the Nihon Ki-in calendar in the corner. The other picture is a part of our living room. We now have a go room! 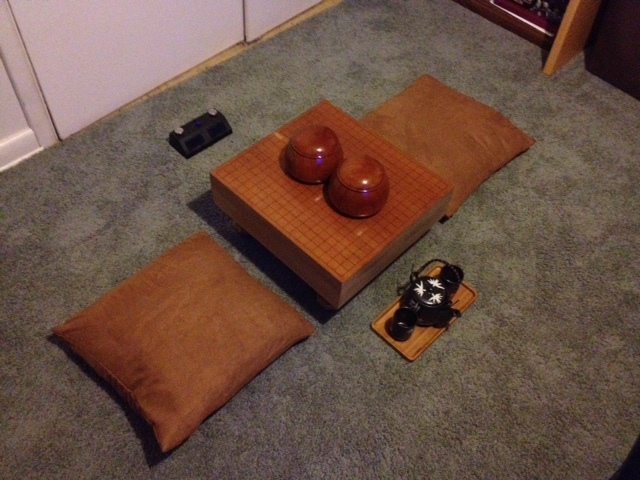 Go board/bowls/stone/wife/cat. Board is a Hyuga kaya masame 1.9 sun 3-piece board from Kuroki Goishiten (http://shop.kurokigoishi.co.jp/en/item/1743 has better pictures). Bowls are shii (castanopsis) [as in shiitake mushrooms, they grow on the fallen wood of this tree]. Stone are size 33 jitsuyo slate and shell from het Paard (Kiseido reseller). Wife and cat are lovely.